Ice on the driveway presents both driving and walking hazards. To safely negotiate your driveway, you'll need to remove the ice. Fortunately, commonly used ice melting products such as salt and magnesium chloride won't harm asphalt. And the dark color of asphalt driveways helps melt ice as the sun heats the dark asphalt. If the ice is only a thin coating, the sun alone might be enough to melt it. For thicker ice, you might need to physically remove the ice. Fill the coffee can with ice melt product. Use salt, sand, or a chemical melter of your choice. Sprinkle the ice melt from the coffee can onto icy spots on your driveway. Place a light coating of the melt product over the ice. Using too much wastes product and doesn't melt the ice faster. Avoid getting the product into flowerbeds or onto shrubs because some chemicals can harm plants. Wait for the ice melt to work. This could take several hours. 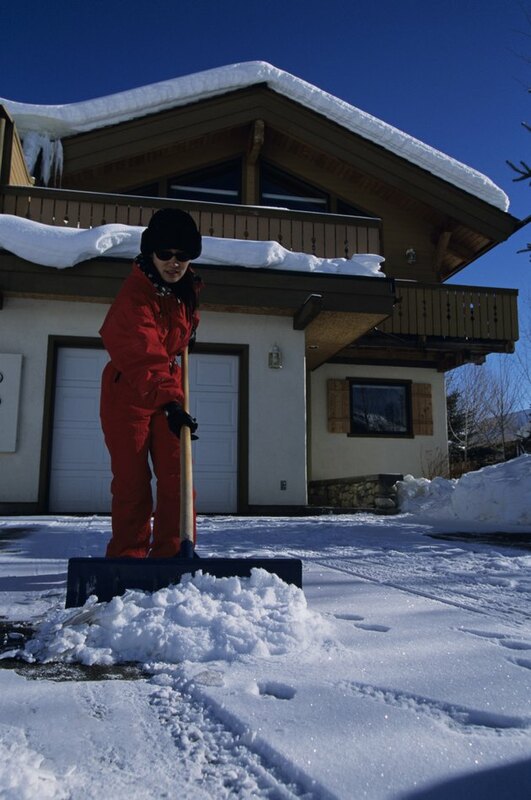 Remove the resulting slush from the driveway with the snow shovel. Slide the shovel along the top of the asphalt to collect the slush. Avoid digging the metal tip of the shovel in and gouging the asphalt. What Does Calcium Chloride Do to My Lawn?